The euro was introduced on January 1, 1999 in accordance with the Maastricht Treaty and became the reality (effective) on January 2002 when the euro became the single currency for about 300 milion citizens of the 12 countries in the Eurozone. The main goal of the euro as a cash currency was to foster closer integration of the euro states and greater price competition within the Eurozone. Euro was also intended to help boost its international role as the doubts grew over the stength of the dollar as the US economy would continue to slow. 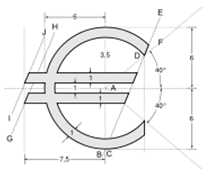 Euro is today not only the global currency but also belongs to global reserve currencies. Central banks hold their reserves diversified in US dollars, Japan yens, and also in European euros. Euro has its origins in the economic crisis of the 1970s. The crisis led to the first plans for a single currency which later became the euro. Euro replaced a system of fixed exchange rates pegged to the US dollar. As a result of the crisis in the 70's, European leaders agreed to create so-called currency snake which was supposed to tie together European currencies. The system immediately came under pressure from the strong dollar, so plans on a new system leading to euro were started. The introduction of the euro enables the world to make the first step toward a single currency for the United States and Europe called eurodollar. In the concept of the eurodollar, the dollar and the euro could be linked together to form a single currency at a 1:1 parity with each other. Basic fact: The euro was launched in 1999 and is today the global currency. Euro is the first step on the way to a global currency called eurodollar.